How do I Upload a File to my Server? There are quite a few ways to upload a file to your server at InMotion Hosting. How you upload your files will depend on your preference and your accessibility to the server. In this tutorial, we will explain how to upload a file using the File Manager, FileZilla, and Notepad++.Â We assume that you know where within your account you need to upload your files. If you're not sure however, please see our article entitled What directory should I put my files in?. There are reasons why a developer would use File Manager, FileZilla, or Notepad++. The following will explain why you would pick one method or the other. File Manager (browser based): The File manager is good to use when you are away form your computer and you can access a browser. The File Manager can be accessed from any location. This eliminates the need to install a program like FileZilla or Notepad++. FileZilla (FTP): FileZilla is good to use for uploading files because it works over port 21 and can upload mass amounts of files all at once. Notepad++ (Code Editor): Using Notepad++ is a way to upload files while you create the content for them, notepad++ is similar to DreamWeaver in that you can Edit files and upload them through the same interface. This eliminates the need to have an HTML editor and a FTP program at the same time. Your file will then upload. 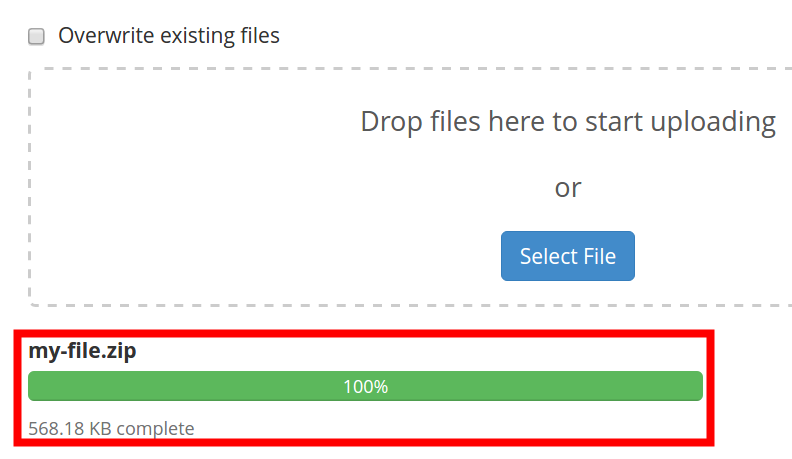 You will see a "100%" message when the upload completes. FileZilla has the ability to upload files from your computer to your server with us. The Left side is the" Local Site" and the Right is the "Remote Site". The "Local Site" is your where your computer files are located. The "Remote Site" is the location of the files on the server. Below is how to upload a file using FileZilla. Navigate your files in the third window on the left underneath the "Local Site:" box where its says"Filename". The Window to the right of it is the "Remote Site" directory. Navigate to the folder where you want to upload the file/folder to in the "Filename" Window underneath the "Remote Site" window. Drag the file you want to upload to the server from the "Local Site" to the "Remote Site". Notepad++ is a program that allows you to edit your site and upload and create files on the server. It is similar to HTML editor programs like Edit Plus or DreamWeaver. Below will explain how to create a file on your server with Notepad++. Connect to your server with Notepad++. In the NppFTP Window on the right side of Notepad++, navigate to the folder you want to upload a file to. Right click the folder and select "Upload other file here. . .". Browse the server for the file you want to upload. Select the file and Click open. Now you will see the file in the folder location on the server. To see other articles available on how to manage your files, please visit How to manage your files on your server?. To learn how to edit a file, see our article How do I edit a file on my server?. We would need more detail about the whole process and any error messages you're seeing in order to properly troubleshoot this issue. If you're using a WAMP environment then you're not working with our hosting service. WAMP is made for a local installation not being accessed through a hosting service. We typically do not provide support for that. If you are using WAMP, then you will need to download the plugin files, then use the WordPress dashboard to upload and load the plugin. The WAMP environment should provide the necessary infrastructure to run WordPress locally. If you're using an add-on domain where the domain's folder is UNDER the public_html folder, the folder path is not affected by the website structure because the domain name is seen as a separate and indvidual domain name. The URL would be: add-on_domain.com/folder1/testfile.pdf - note that you would need to put the PUBLIC_HTML folder or the primary domain name in the path. I hope this helps to explain it. If you're still having issues with understanding how to determine a path for a file you have uploaded, then please submit another question and provide any further details that would help to clarify the issue. Sir we have upload our html file throught file manger and it's uploaded successfully but can't find the link on which we can show it's output to public. How to find link which show output of that uploaded html file. i can't fix that bug.....plz advice me..
Could you provide a link to your site, so we can help you troubleshoot further? Thank you for contacting us. The above guide explains how to upload a file via FileZilla. If you are having trouble connecting, here is a link to our guide on Configuring your site in FileZilla. Thanks for responding Scott. That's exactly what I'm looking for. I've been working on this for far too long. I keep coming across that type of code but I can't get the dots to connect. Everytime I use the browse button I have a problem with the upload process. I really like the way you guys respond to the public without asking us to open an account before you respond. Thank you for the kind words Tony, we want everyone to feel comfortable asking questions. We don't have all the answers, but we try to point you in the right direction if we do not. With your situation, is there an error message or particular behavior you encounter when the browse button is clicked? Do you have any articles on creating a browse button so other can upload files and picturs to your browser? While you will not upload files to your browser as it lives on your local machine, you can set up some code to allow you to upload files and images to your hosting account. We do not currently have an article with this code, but there is a good tutorial at W3Schools that goes over this for you. I've followed the instructions above and uploaded a file using File Manager. How do I SEND A LINK VIA EMAIL to my client so they can access the file? Thank you for contacting us. After uploading a file, you can Hotlink, or Directlink to the file, which is explained in this article. I'm in filezilla and need to know which file to upload my muse(local) file to. I tried to upload it to public_html and it wasn't quite right. Any help? When you are uploading a file to your account, the location you put the file in depends what you are trying to accomplish. I recommend reading our guide that explains what directory to put your files in.